Cable retention exceeds 40 lb. For Quad-shield coaxial cable featuring a 360 degree compression seal. Snap N Seal drop connectors for 6 Series cable feature industry leading compression technology. They are the coax cable connection of choice for Advanced Broadband Communication and Satellite companies such as Comcast, Charter, EchoStar, DirecTV and Time Warner. Most problems occur at the connector due to incorrect cable preparation or connector installation. 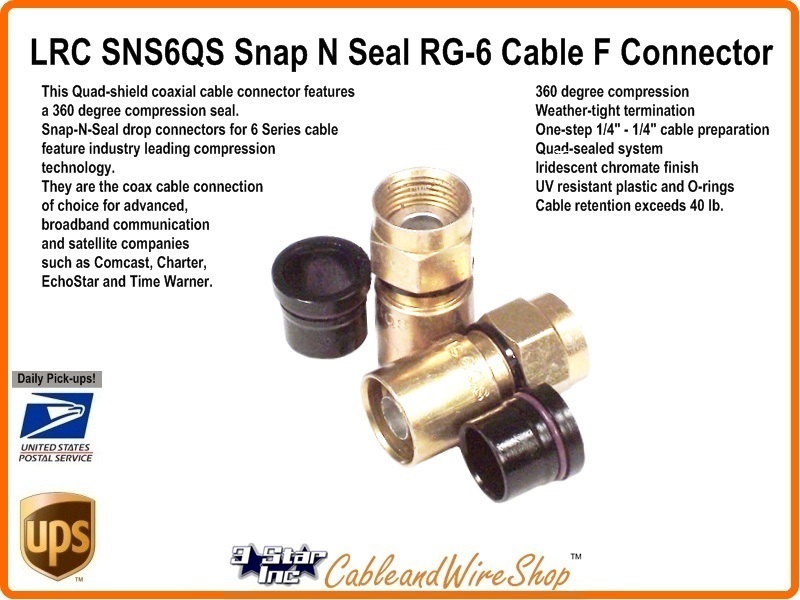 The Snap N Seal system is designed to minimize problems due to craftsmanship issues and to significantly reduce future connector related maintenance issues. See the PCT TRS-6, PPC EX6XL and SNS1P6U Universal Shield RG6 Connector Replacements for this Connector. Use Compression Tool IT1000 and Stripping Tool CST596. Note: Thomas & Betts, formally LRC; is a mainstay of the Coaxial Cable Connector Industry. As Time has Progressed, so has this Connector. T&B now offers a Universal Connector that is not Shield or Braid percentage Specific. See below!